It’s a welcome return to the racks for Fist’s ‘Back With A Vengeance’ CD which has been lovingly re-issued by Dissonance, the original 2002 Sanctuary version having been deleted many years ago. I’ll freely admit I have a soft spot for this album, as of all the Sanctuary re-issues I worked on this was one of my favourites. The first disc is a relatively straightforward romp through the band’s output on Neat Records and kicks off with both sides of the ‘Name, Rank & Serial Number’ 7” and the two tracks from the ‘Lead Weight’ compilation. After that, the tracklist then jumps a couple of years to include the whole ‘Back With A Vengeance’ LP which Neat released after the band had been dropped by MCA Records. 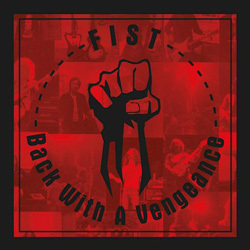 With a radical line-up change, the new-look Fist served up a more polished offering, more in tune with the NWOBHM’s latter days, and despite some strong songs and a fabulous vocalist in Glen Coates (ex-Hollow Ground) it’s one of those marmite albums that divide the faithful straight down the middle. The band’s final release of the time, a cover of ‘The Wanderer’ wraps things up. It’s the second disc though that makes this an essential purchase. After the ‘Name…’ single the original line-up of Dave Irwin, Keith Satchfield, John Wylie and Harry ‘Hiroshima’ Hill signed to MCA and recorded an album ‘Turn The Hell On’ which, as Hill notes in the book ‘Neat & Tidy’ “sounded too calm and respectable, and nothing like what the band was about.” However, before they packed their bags and caught the train to London they’d demoed a substantial amount of material at Neat’s Impulse Studios. This was lovingly sifted through for the re-issue CD, and the result is the ‘Turn The Hell On’ material much more as it was meant to be heard, with the in-your-face aggression and don’t-give-a-toss attitude that was Fist live, plus a bucketload of extra material, most of which had never been heard before. “I think the demos, the versions that appeared on the Sanctuary Records compilation sound better than the album,” claims Irwin in ‘Neat & Tidy’. And you can’t really get a much better recommendation than that, can you?